This document is part of the Filament project. To report errors in this document please use the project&apos;s issue tracker. 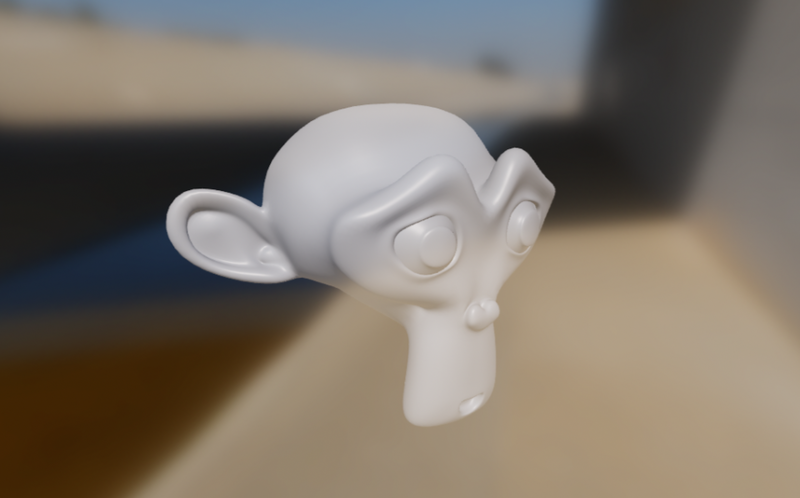 Filament is a physically based rendering (PBR) engine for Android. Filament offers a customizable material system that you can use to create both simple and complex materials. This document describes all the features available to materials and how to create your own material. Also called shading model or lighting model, the material model defines the intrinsic properties of a surface. These properties have a direct influence on the way lighting is computed and therefore on the appearance of a surface. A text file that describes all the information required by a material. This is the file that you will directly author to create new materials. At runtime, materials are loaded from material packages compiled from material definitions using the matc tool. A material package contains all the information required to describe a material, and shaders generated for the target runtime platforms. This is necessary because different platforms (Android, macOS, Linux, etc.) use different graphics APIs or different variants of similar graphics APIs (OpenGL vs OpenGL ES for instance). A material instance is a reference to a material and a set of values for the different values of that material. Material instances are not covered in this document as they are created and manipulated directly from code using Filament&apos;s APIs. The lit model is Filament&apos;s standard material model. This physically-based shading model was designed after to offer good interoperability with other common tools and engines such as Unity 5, Unreal Engine 4, Substance Designer or Marmoset Toolbag. This material model can be used to describe a large number of non-metallic surfaces (dielectrics) or metallic surfaces (conductors). The appearance of a material using the standard model is controlled using the properties described in table 1. The type and range of each property is described in table 2. Several material model properties expect RGB colors. Filament materials use RGB colors in linear space and you must take proper care of supplying colors in that space. See the Linear colors section for more information. Filament materials expect colors to use pre-multiplied alpha. See the Pre-multiplied alpha section for more information. The baseColor property defines the perceived color of an object (sometimes called albedo). The effect of baseColor depends on the nature of the surface, controlled by the metallic property explained in the Metallic section. Defines the diffuse color of the surface. Real-world values are typically found in the range \([10..240]\) if the value is encoded between 0 and 255, or in the range \([0.04..0.94]\) between 0 and 1. Several examples of base colors for non-metallic surfaces can be found in table 3. Defines the specular color of the surface. Real-world values are typically found in the range \([170..255]\) if the value is encoded between 0 and 255, or in the range \([0.66..1.0]\) between 0 and 1. Several examples of base colors for metallic surfaces can be found in table 4. The metallic property defines whether the surface is a metallic (conductor) or a non-metallic (dielectric) surface. This property should be used as a binary value, set to either 0 or 1. Intermediate values are only truly useful to create transitions between different types of surfaces when using textures. This property can dramatically change the appearance of a surface. Non-metallic surfaces have chromatic diffuse reflection and achromatic specular reflection (reflected light does not change color). 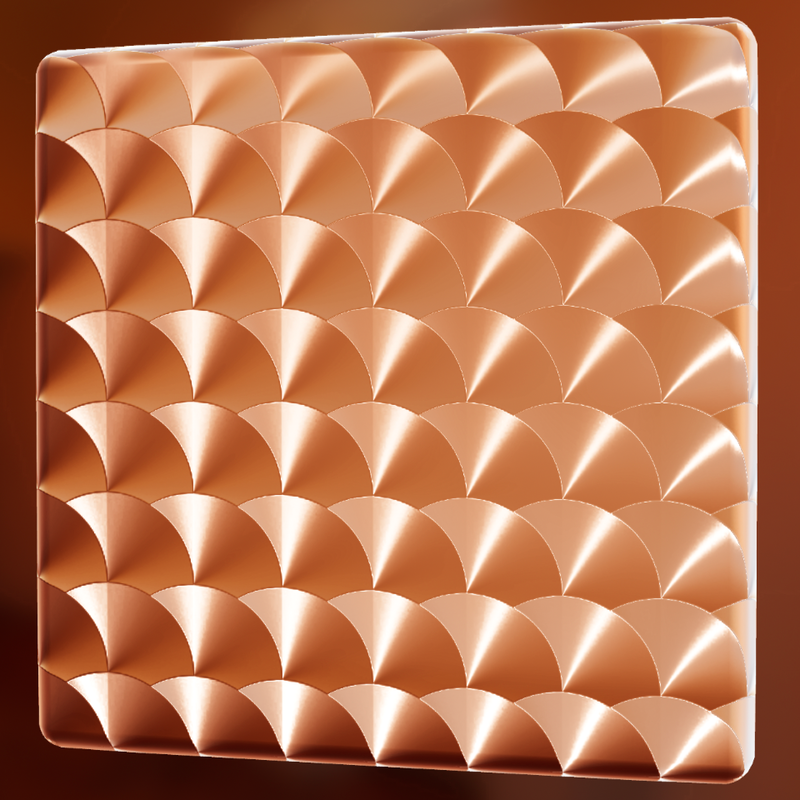 Metallic surfaces do not have any diffuse reflection and chromatic specular reflection (reflected light takes on the color of the surfaced as defined by baseColor). The effect of metallic is shown in figure 1 (click on the image to see a larger version). The roughness property controls the perceived smoothness of the surface. When roughness is set to 0, the surface is perfectly smooth and highly glossy. The rougher a surface is, the “blurrier” the reflections are. This property is often called glossiness in other engines and tools, and is simply the opposite of the roughness (roughness = 1 - glossiness). The effect of roughness on non-metallic surfaces is shown in figure 2 (click on the image to see a larger version). The effect of roughness on metallic surfaces is shown in figure 3 (click on the image to see a larger version). The reflectance property only affects non-metallic surfaces. This property can be used to control the specular intensity. 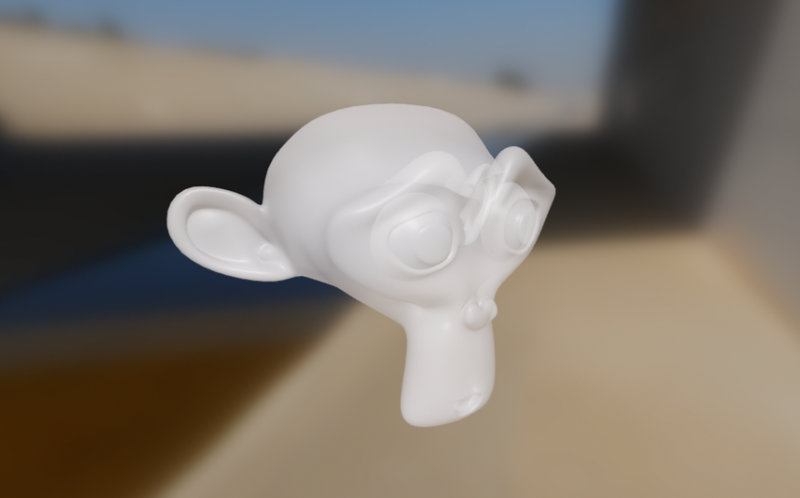 This value is defined between 0 and 1 and represents a remapping of a percentage of reflectance. 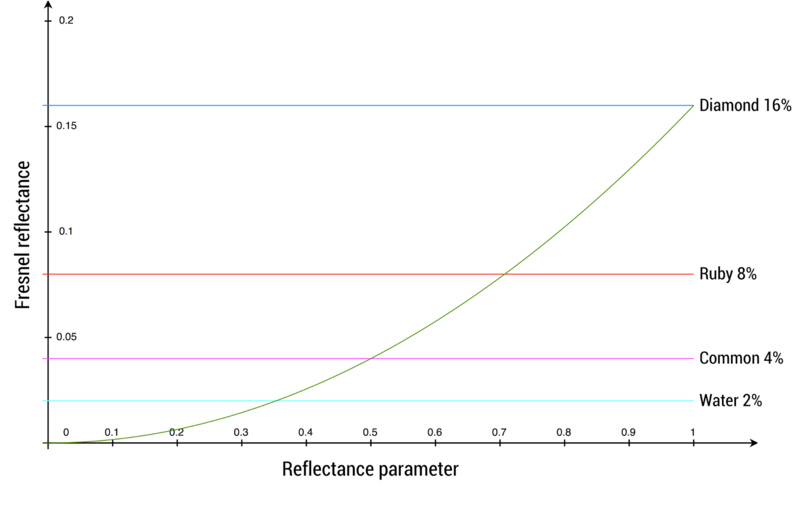 For instance, the default value of 0.5 corresponds to a reflectance of 4%. Values below 0.35 (2% reflectance) should be avoided as no real-world materials have such low reflectance. The effect of reflectance on non-metallic surfaces is shown in figure 4 (click on the image to see a larger version). Figure 5 shows common values and how they relate to the mapping function. Table 5 describes acceptable reflectance values for various types of materials (no real world material has a value under 2%). Multi-layer materials are fairly common, particularly materials with a thin translucent layer over a base layer. Real world examples of such materials include car paints, soda cans, lacquered wood and acrylic. The clearCoat property can be used to describe materials with two layers. The clear coat layer will always be isotropic and dielectric. The clearCoat property controls the strength of the clear coat layer. This should be treated as a binary value, set to either 0 or 1. Intermediate values are useful to control transitions between parts of the surface that have a clear coat layers and parts that don&apos;t.
The effect of clearCoat on a rough metal is shown in figure 7 (click on the image to see a larger version). The clear coat layer effectively doubles the cost of specular computations. Do not assign a value, even 0.0, to the clear coat property if you don&apos;t need this second layer. The clearCoatRoughness property is similar to the roughness property but applies only to the clear coat layer. In addition, since clear coat layers are never completely rough, the value between 0 and 1 is remapped internally to an actual roughness of 0 to 0.6. The effect of clearCoatRoughness on a rough metal is shown in figure 8 (click on the image to see a larger version). 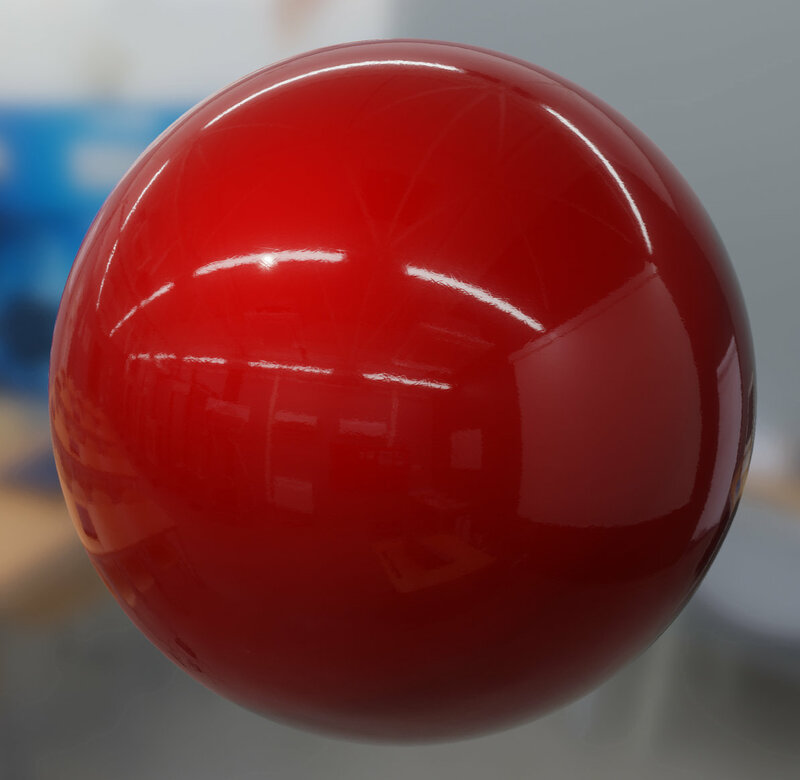 Many real-world materials, such as brushed metal, can only be replicated using an anisotropic reflectance model. A material can be changed from the default isotropic model to an anisotropic model by using the anisotropy property. The effect of anisotropy on a rough metal is shown in figure 10 (click on the image to see a larger version). The figure 11 below shows how the direction of the anisotropic highlights can be controlled by using either positive or negative values: positive values define anisotropy in the tangent direction and negative values in the bitangent direction. The anisotropic material model is slightly more expensive than the standard material model. Do not assign a value (even 0.0) to the anisotropy property if you don&apos;t need anisotropy. The anisotropyDirection property defines the direction of the surface at a given point and thus control the shape of the specular highlights. It is specified as vector of 3 values that usually come from a texture, encoding the directions local to the surface. The effect of anisotropyDirection on a metal is shown in figure 13 (click on the image to see a larger version). The result shown in figure 13 was obtained using the direction map shown in figure 13. The ambientOcclusion property defines how much of the ambient light is accessible to a surface point. It is a per-pixel shadowing factor between 0.0 (fully shadowed) and 1.0 (fully lit). This property only affects diffuse indirect lighting (image-based lighting), not direct lights such as directional, point and spot lights, nor specular lighting. The normal property defines the normal of the surface at a given point. It usually comes from a normal map texture, which allows to vary the property per-pixel. The normal is supplied in tangent space, which means that +Z points outside of the surface. For example, let&apos;s imagine that we want to render a piece of furniture covered in tufted leather. Modeling the geometry to accurately represent the tufted pattern would require too many triangles so we instead bake a high-poly mesh into a normal map. Once the base map is applied to a simplified mesh, we get the result in figure 15. Note that the normal property affects the base layer and not the clear coat layer. Using a normal map increases the runtime cost of the material model. The clearCoatNormal property defines the normal of the clear coat layer at a given point. It behaves otherwise like the normal property. Using a clear coat normal map increases the runtime cost of the material model. The emissive property can be used to simulate additional light emitted by the surface. It is defined as a float4 value that contains an RGB color (in linear space) as well as an exposure compensation value (in the alpha channel). Even though an exposure value actually indicates combinations of camera settings, it is often used by photographers to describe light intensity. This is why cameras let photographers apply an exposure compensation to over or under-expose an image. This setting can be used for artistic control but also to achieve proper exposure (snow for instance will be exposed for as 18% middle-grey). The exposure compensation value of the emissive property can be used to force the emissive color to be brighter (positive values) or darker (negative values) than the current exposure. If the bloom effect is enabled, using a positive exposure compensation can force the surface to bloom. The postLightingColor can be used to modify the surface color after lighting computations. This property has no physical meaning and only exists to implement specific effects or to help with debugging. This property is defined as a float4 value containing a pre-multiplied RGB color in linear space. The post-lighting color is blended with the result of lighting according to the blending mode specified by the postLightingBlending material option. Please refer to the documentation of this option for more information. postLightingColor can be used as a simpler emissive property by setting postLightingBlending to add and by providing an RGB color with alpha set to 0.0. All the material models described previously are designed to simulate dense surfaces, both at a macro and at a micro level. Clothes and fabrics are however often made of loosely connected threads that absorb and scatter incident light. 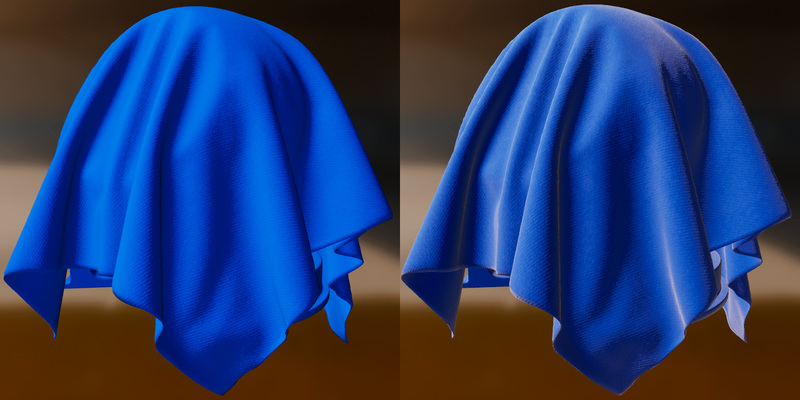 When compared to hard surfaces, cloth is characterized by a softer specular lob with a large falloff and the presence of fuzz lighting, caused by forward/backward scattering. Some fabrics also exhibit two-tone specular colors (velvets for instance). Figure 17 shows how the standard material model fails to capture the appearance of a sample of denim fabric. The surface appears rigid (almost plastic-like), more similar to a tarp than a piece of clothing. This figure also shows how important the softer specular lobe caused by absorption and scattering is to the faithful recreation of the fabric. 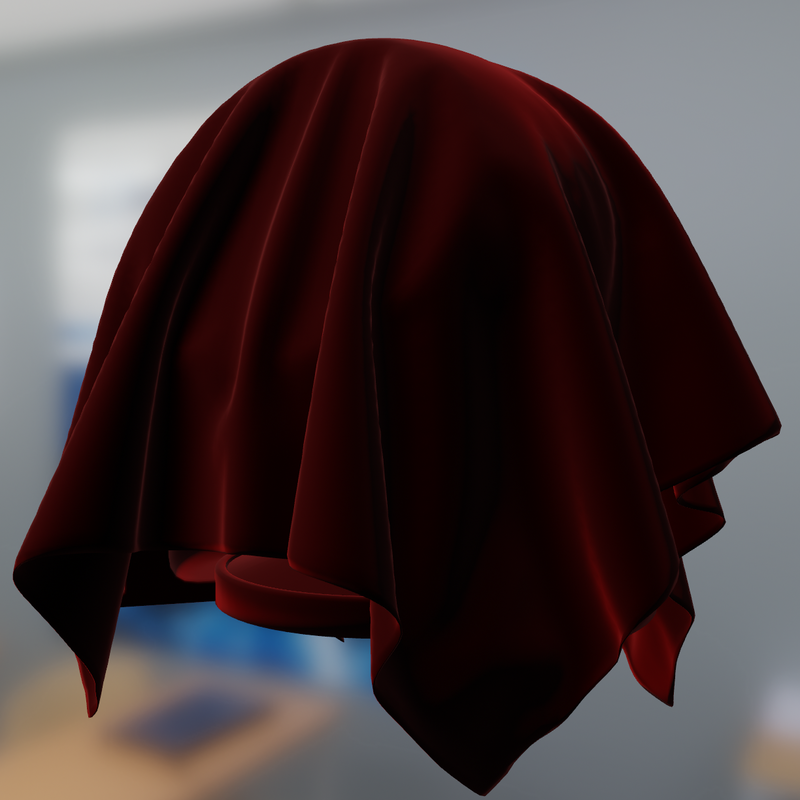 Velvet is an interesting use case for a cloth material model. As shown in figure 18 this type of fabric exhibits strong rim lighting due to forward and backward scattering. These scattering events are caused by fibers standing straight at the surface of the fabric. When the incident light comes from the direction opposite to the view direction, the fibers will forward scatter the light. Similarly, when the incident light from the same direction as the view direction, the fibers will scatter the light backward. It is important to note that there are types of fabrics that are still best modeled by hard surface material models. For instance, leather, silk and satin can be recreated using the standard or anisotropic material models. The cloth material model encompasses all the parameters previously defined for the standard material mode except for metallic and reflectance. Two extra parameters described in table 6 are also available. The type and range of each property is described in table 7. To create a velvet-like material, the base color can be set to black (or a dark color). Chromaticity information should instead be set on the sheen color. To create more common fabrics such as denim, cotton, etc. use the base color for chromaticity and use the default sheen color or set the sheen color to the luminance of the base color. To see the effect of the roughness parameter make sure the sheenColor is brighter than baseColor. This can be used to create a fuzz effect. Taking the luminance of baseColor as the sheenColor will produce a fairly natural effect that works for common cloth. A dark baseColor combined with a bright/saturated sheenColor can be used to create velvet. The subsurfaceColor parameter should be used with care. High values can interfere with shadows in some areas. It is best suited for subtle transmission effects through the material. The sheenColor property can be used to directly modify the specular reflectance. It offers better control over the appearance of cloth and gives give the ability to create two-tone specular materials. The effect of sheenColor is shown in figure 19 (click on the image to see a larger version). The subsurfaceColor property is not physically-based and can be used to simulate the scattering, partial absorption and re-emission of light in certain types of fabrics. This is particularly useful to create softer fabrics. 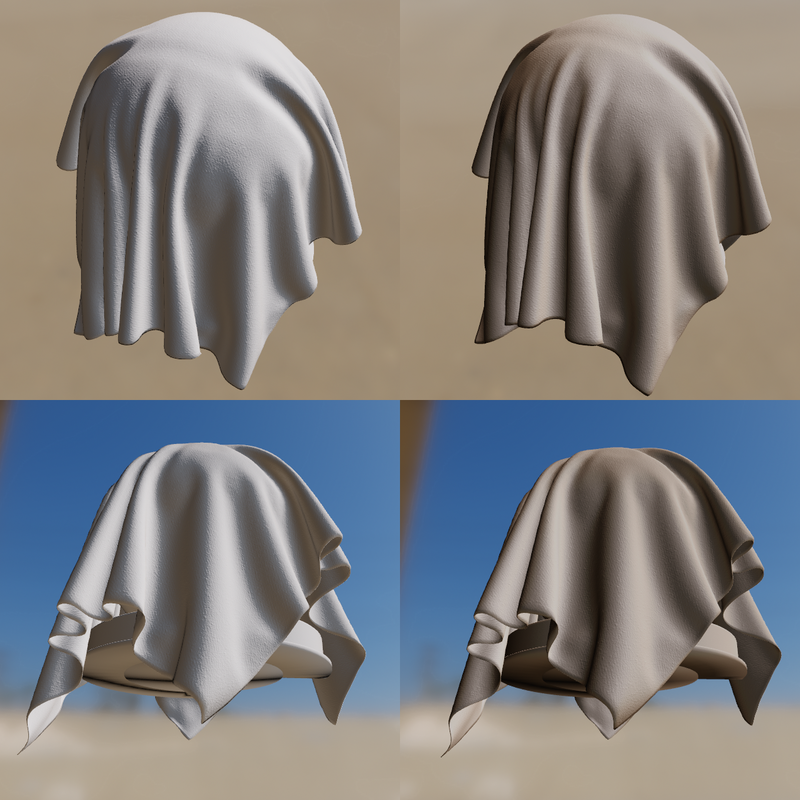 The cloth material model is more expensive to compute when the subsurfaceColor property is used. The effect of subsurfaceColor is shown in figure 20 (click on the image to see a larger version). The unlit material model can be used to turn off all lighting computations. Its primary purpose is to render pre-lit elements such as a cubemap, external content (such as a video or camera stream), user interfaces, visualization/debugging etc. The unlit model exposes only two properties described in table 8. The type and range of each property is described in table 9. The value of emissive is simply added to baseColor when present. The main use of emissive is to force an unlit surface to bloom if the HDR pipeline is configured with a bloom pass. The value of postLightingColor is blended with the sum of emissive and baseColor according to the blending mode specified by the postLightingBlending material option. Figure 21 shows an example of the unlit material model (click on the image to see a larger version). This alternative lighting model exists to comply with legacy standards. Since it is not a physically-based formulation, we do not recommend using it except when loading legacy assets. This model encompasses the parameters previously defined for the standard lit mode except for metallic, reflectance, and roughness. It adds parameters for specularColor and glossiness. The type and range of each property is described in table 11. A minimum viable material definition must contain a material section and a fragment block. The vertex block is optional. Quotes remain mandatory when the string contains spaces. The vertex and fragment blocks contain unescaped, unquoted GLSL code, which is not valid in JSON. Single-line C++-style comments are allowed. The key of a pair is case-sensitive. The value of a pair is not case-sensitive. The following code listing shows an example of a valid material definition. This definition uses the lit material model (see Lit model section), uses the default opaque blending mode, requires that a set of UV coordinates be presented in the rendered mesh and defines 3 user parameters. The following sections of this document describe the material and fragment blocks in detail. The material block is mandatory block that contains a list of property pairs to describe all non-shader data. Any string. Double quotes are required if the name contains spaces. Sets the name of the material. The name is retained at runtime for debugging purpose. Any of lit, subsurface, cloth, unlit, specularGlossiness. Defaults to lit. Selects the material model as described in the Material models section. Each entry is an object with the properties name and type, both of string type. The name must be a valid GLSL identifier. The type must be one of the types described in table 12. Sampler types can also specify a format (defaults to float) and a precision (defaults to default). The format can be one of int, float. The precision can be one of default (best precision for the platform, typically high on desktop, medium on mobile), low, medium, high. A parameter can define an array of values by appending [size] after the type name, where size is a positive integer. For instance: float declares an array of nine float values. Arrays of samplers are not supported at the moment. Samplers types: use the parameter name prefixed with materialParams_. For instance, materialParams_myTexture. Other types: use the parameter name as the field of a structure called materialParams. For instance, materialParams.myColor. Each entry must be any of uv0, uv1, color, position, tangents. Lists the vertex attributes required by the material. The position attribute is always required and does not need to be specified. The tangents attribute is automatically required when selecting any shading model that is not unlit. See the shader sections of this document for more information on how to access these attributes from the shaders. Up to 4 strings, each must be a valid GLSL identifier. Defines custom interpolants (or variables) that are output by the material&apos;s vertex shader. Each entry of the array defines the name of an interpolant. The full name in the fragment shader is the name of the interpolant with the variable_ prefix. For instance, if you declare a variable called eyeDirection you can access it in the fragment shader using variable_eyeDirection. In the vertex shader, the interpolant name is simply a member of the MaterialVertexInputs structure (material.eyeDirection in your example). Each interpolant is of type float4 (vec4) in the shaders. Any of opaque, transparent, fade, add, masked. Defaults to opaque. Opaque: blending is disabled, the alpha channel of the material&apos;s output is ignored. Transparent: blending is enabled. The material&apos;s output is alpha composited with the render target, using Porter-Duff&apos;s source over rule. This blending mode assumes pre-multiplied alpha. Fade: acts as transparent but transparency is also applied to specular lighting. In transparent mode, the material&apos;s alpha values only applies to diffuse lighting. This blending mode is useful to fade lit objects in and out. Add: blending is enabled. The material&apos;s output is added to the content of the render target. Masked: blending is disabled. This blending mode enables alpha masking. The alpha channel of the material&apos;s output defines whether a fragment is discarded or not. See the maskThreshold section for more information. Any of opaque, transparent, add. Defaults to transparent. Opaque: blending is disabled, the material will output postLightingColor directly. Transparent: blending is enabled. The material&apos;s computed color is alpha composited with the postLightingColor, using Porter-Duff&apos;s source over rule. This blending mode assumes pre-multiplied alpha. Add: blending is enabled. The material&apos;s computed color is added to postLightingColor. Any of object, world, view, device. Defaults to object. World: the vertices are defined in world coordinate space. The vertices are not transformed using the rendered object&apos;s transform. View: the vertices are defined in view (or eye or camera) coordinate space. The vertices are not transformed using the rendered object&apos;s transform. Device: the vertices are defined in normalized device (or clip) coordinate space. The vertices are not transformed using the rendered object&apos;s transform. Any of smooth, flat. Defaults to smooth. Defines how interpolants (or variables) are interpolated between vertices. When this property is set to smooth, a perspective correct interpolation is performed on each interpolant. When set to flat, no interpolation is performed and all the fragments within a given triangle will be shaded the same. Any of none, front, back, frontAndBack. Defaults to back. Defines which triangles should be culled: none, front-facing triangles, back-facing triangles or all. true or false. Defaults to true. Enables or disables writes to the color buffer. Enables or disables writes to the depth buffer. Enables or disables depth testing. 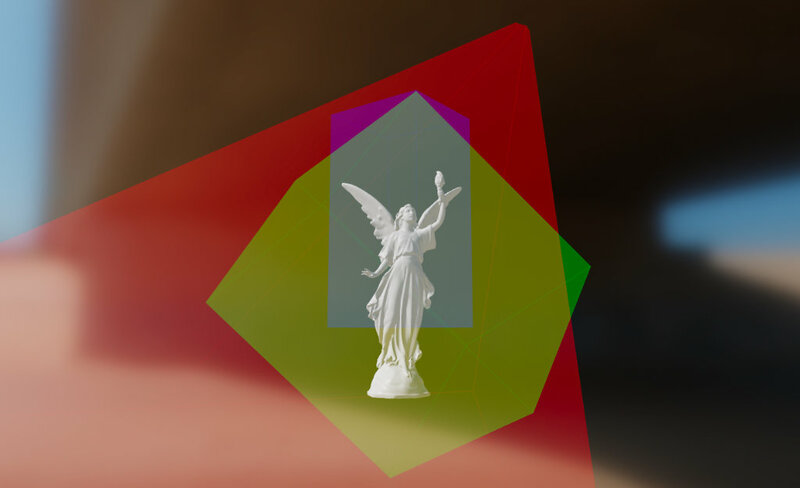 When depth testing is disabled, an object rendered with this material will always appear on top of other opaque objects. true or false. Defaults to false. Enables two-sided rendering and its capability to be toggled at run time. When set to true, culling is automatically set to none; if the triangle is back-facing, the triangle&apos;s normal is flipped to become front-facing. When explicitly set to false, this allows the doubleSided property to be toggled at run time. Any of default, twoPassesOneSide or twoPassesTwoSides. Defaults to default. Controls how transparent objects are rendered. It is only valid when the blending mode is not opaque. None of these methods can accurately render concave geometry, but in practice they are often good enough. default: the transparent object is rendered normally (as seen in figure 22), honoring the culling mode, etc. twoPassesOneSide: the transparent object is first rendered in the depth buffer, then again in the color buffer, honoring the cullling mode. This effectively renders only half of the transparent object as shown in figure 23.
twoPassesTwoSides: the transparent object is rendered twice in the color buffer: first with its back faces, then with its front faces. This mode lets you render both set of faces while reducing or eliminating sorting issues, as shown in figure 24. twoPassesTwoSides can be combined with doubleSided for better effect. A value between 0.0 and 1.0. Defaults to 0.4. Sets the minimum alpha value a fragment must have to not be discarded when the blending mode is set to masked. When the blending mode is not masked, this value is ignored. This value can be used to controlled the appearance of alpha-masked objects. Only available in the unlit shading model. If this property is enabled, the final color computed by the material is multiplied by the shadowing factor (or visibility). This allows to create transparent shadow-receiving objects (for instance an invisible ground plane in AR). 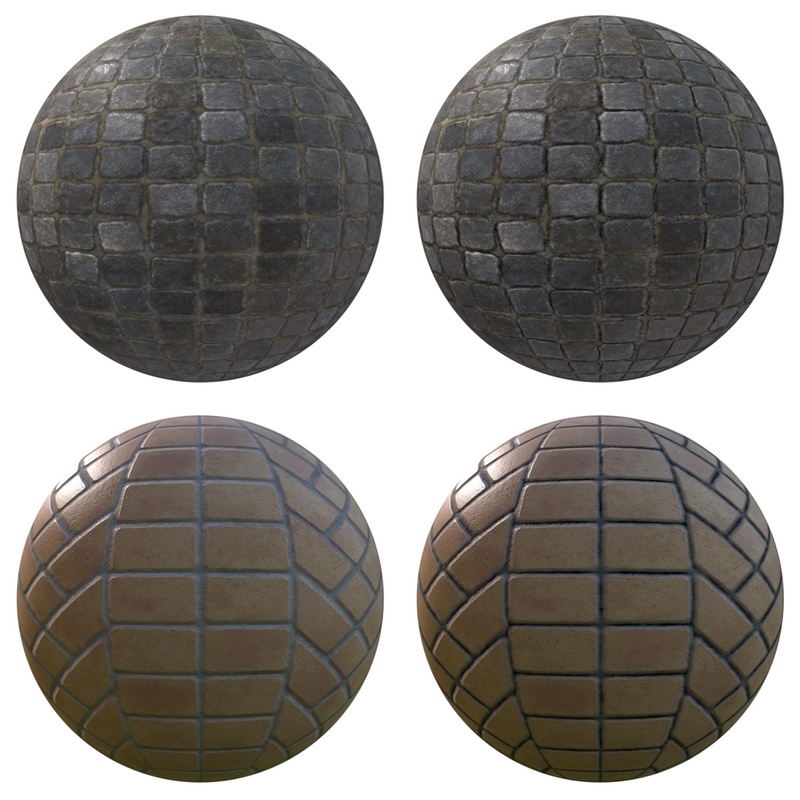 Reduces specular aliasing by increasing roughness based on the local geometric curvature. This property is particularly effective if you only use MSAA as your anti-aliasing method. 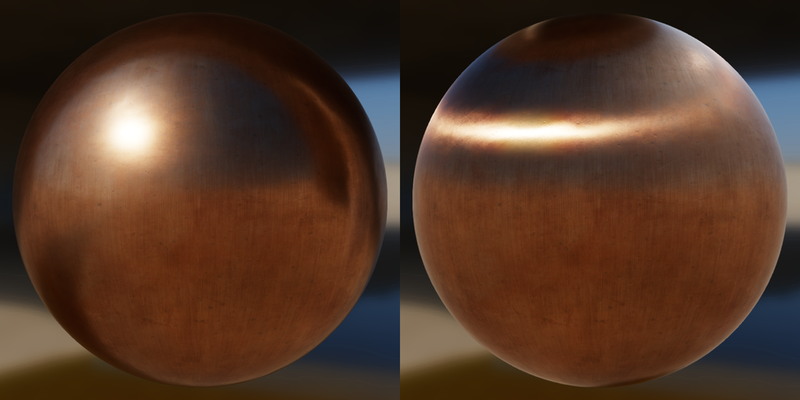 Figure 25: Close up of a glossy metallic surface rendered normally (left) and with curvatureToRoughness (right). Reduces specular aliasing by attempting to eliminate normal over-interpolation. When this property is turned on, the material switches to centroid normal interpolation when the interpolated normals are too long. This property should only be used if your anti-aliasing method is MSAA. The effects are a lot more subtle than curvatureToRoughness, which should be used first to eliminate specular aliasing. When adding a clear coat layer, the change in index of refraction (IoR) is taken into account to modify the specular color of the base layer. This appears to darken baseColor. When this effect is disabled, baseColor is left unmodified. See figure 26 for an example of how this property can affect a red metallic base layer. Figure 26: The same rough metallic ball with a clear coat layer rendered with clearCoatIorChange enabled (left) and disabled (right). Each entry must be any of dynamicLighting, directionalLighting, shadowReceiver or skinning. Used to specify a list of shader variants that the application guarantees will never be needed. These shader variants are skipped during the code generation phase, thus reducing the overall size of the material. Note that some variants may automatically be filtered out. For instance, all lighting related variants (directionalLighting, etc.) are filtered out when compiling an unlit material. Use the variant filter with caution, filtering out a variant required at runtime may lead to crashes. When set to true (default value), the Y coordinate of UV attributes will be flipped when read by this material&apos;s vertex shader. Flipping is equivalent to y = 1.0 - y. When set to false, flipping is disabled and the UV attributes are read as is. This function will be invoked automatically at runtime by the shading system and gives you the ability to read and modify material properties using the MaterialVertexInputs structure. This full definition of the structure can be found in the Material vertex inputs section. In addition to the MaterialVertexInputs structure, your vertex shading code can use all the public APIs listed in the Shader public APIs section. By default the vertex shader of a material will flip the Y coordinate of the UV attributes of the current mesh: material.uv0 = vec2(mesh_uv0.x, 1.0 - mesh_uv0.y). You can control this behavior using the flipUV property and setting it to false. This function will be invoked automatically at runtime by the shading system and gives you the ability to read and modify material properties using the MaterialInputs structure. This full definition of the structure can be found in the Material fragment inputs section. The full definition of the various members of the structure can be found in the Material models section of this document. Note that you must call prepareMaterial(material) before exiting the material() function. This prepareMaterial function sets up the internal state of the material mdoel. Some of the APIs described in the Fragment APIs section - like shading_normal for instance - can only be accessed after invoking prepareMaterial(). getWorldTangentFrame() float3×3 Matrix containing in each column the tangent (frame), bi-tangent (frame) and normal (frame) of the vertex in world space. If the material does not compute a tangent space normal for bump mapping or if the shading is not anisotropic, only the normal is valid in this matrix. matc attempts to validate shaders when compiling a material package. The example below shows an example of an error message generated when compiling a material definition containing a typo in the fragment shader (metalic instead of metallic). The reported line numbers are line numbers in the source material definition file. ERROR: 2 compilation errors. No code generated. The command line flags relevant to application development are described in table 13.
matc offers a few other flags that are irrelevant to application developers and for internal use only. This flag applies fewer optimization techniques to try and keep the final material as small as possible. If the compiled material is deemed too large by default, using this flag might be a good compromise between runtime performance and size. This flag was designed to help build tools around matc. It allows you to print out specific metadata in JSON format. The example below prints out the list of parameters defined in Filament&apos;s standard skybox material. It produces a list of 2 parameters, named showSun and skybox, respectively a boolean and a cubemap texture. This flag can be used to further reduce the size of a compiled material. It is used to specify a list of shader variants that the application guarantees will never be needed. These shader variants are skipped during the code generation phase of matc, thus reducing the overall size of the material. Note that some variants may automatically be filtered out. For instance, all lighting related variants (directionalLighting, etc.) are filtered out when compiling an unlit material. When this flag is used, the specified variant filters are merged with the variant filters specified in the material itself. Use this flag with caution, filtering out a variant required at runtime may lead to crashes. If the color is sampled from a texture, you can simply ensure that the texture data is pre-multiplied ahead of time. On Android, any texture uploaded from a Bitmap will be pre-multiplied by default.